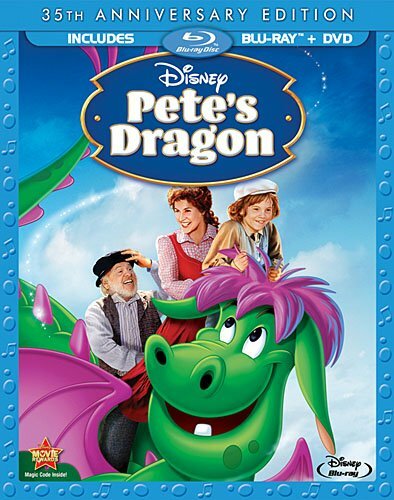 Pete's Dragon tells the story of a young orphan boy named Pete and his dragon friend Elliott. Elliott is usually invisible to everyone except Pete, but he can show himself when he wants to, or when he's sleeping apparently. And somehow Pete can see Elliott even when he is invisible and Pete knows it, so I'm not sure how that works. Does he see a semi-transparent Elliott? Anyway, the movie starts with Pete in the middle of running away from his adopted family who are some mean hillbillies folks called the Gogans. During the chase, the Gorans start doing a song and dance number about all the awful stuff they're going to do to Pete, and unless I heard it wrong it sounded like they were saying different ways they were going to kill him, which seemed rather odd to me. I'd like to just take a moment to mention that there are a lot of song and dance numbers in this movie. Some of the songs aren't bad, but others didn't feel up to par and I really felt they could have cut maybe two or three of them out to increase the pace of the movie. As it is, this film is over two hours long. The back of the DVD case says the feature running time is approximately 88 minutes, which is totally false. I don't know how they came up with that number... maybe they were using a template from another movie, but the actual running time is more like 129 minutes. Anyway, the movie plot movies forward with two basic stories. One is that Pete and Elliott find their way to a town called Passamaquoddy and Elliott gets him into trouble by causing a bunch of damage in the town, and then Pete is taken in by a nice lady named Nora who wants to help him out. The other plot involves a traveling medicine man named Doc Terminus who shows up in the same town and has all the townsfolk angry with him. The two stories collide when Doc Terminus discovers Elliotte is a real dragon and wants to capture him in order to make potions. It's a decent story but it just felt rather simple for how extremely long the movie was. As I mentioned early, I think if they just cut out several of the song and dance routines that added nothing to the story then it would have flowed much better. There was even one song sequence where there was no dancing at all, it was just Nora in front of the lighthouse standing there and singing. The song wasn't bad but it was still boring because all she did was stand there for the entire song. Oh, I probably should have mentioned that when Elliott is visible, he is a cartoon dragon. Nowadays the blending of the animation and live-action would have looked much better, but since this was made back in the mid-70s I can't really complain. I liked that they didn't have the dragon talk, he just made sounds which Pete could somehow understand. Brazzle Dazzle Effects: Behind Disney's Movie Magic -- Learn about the history of Disney's magical mix of live-action and animation. Narrated by Sean Marshall (Pete)! Original Song Concept: "Boo Bop Bopbop Bop (I Love You, Too)" -- Hear the first demo recording from 1976, with early story sketches of Pete singing to Elliot! There are others like art gallery and previews but those hardly count. The Brazzle Dazzle Effects is definitely the most interesting one of the extras. This set contains both a Blu-ray and DVD, and the DVD only has the Original Song Concept: "Boo Bop Bopbop Bop (I Love You, Too)", which is too bad since I think Brazzle Dazzle Effects: Behind Disney's Movie Magic would have been a better extra to include, but then that's like a half hour long and with the movie being over two hours I can understand why they could only include a short two and a half minute extra feature. Anyway, it's not a bad film by any means, so I'd say it be worth renting.